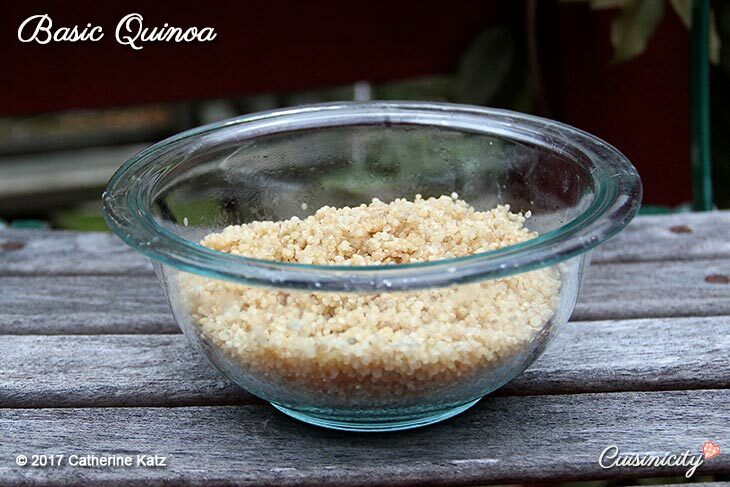 Quinoa is a staple in my kitchen! I love its sweet taste and texture. 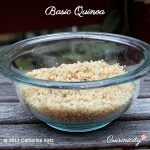 It is a delicious gluten-free whole grain with fiber and is one of the most protein-rich foods we can eat, containing all 9 essential amino acids (I just found that out myself!). This basic recipe is a no fuss, full-proof, always perfectly cooked, not mushy (very important! ), fluffy, yummy whole grain side dish. It takes all of 8 minutes to get on the table! If you have some extra in the fridge (it keeps well–no clumps! ), you will want to make the Quinoa Kale & Corn Salad with fresh mint–so tasty. I also like to serve my Chicken Fricassée over it. The options are limitless! Add the dry quinoa, stir once and cook, uncovered for exactly 6 minutes. Turn off the stove (don’t worry if it doesn’t look completely cooked yet—that’s OK at this point!) and cover for 2 minutes. Stir with a fork to fluff up and serve.